Düsseldorf, Kunstmuseum, Kupferstichkabinett, Inv. no. FP 195. 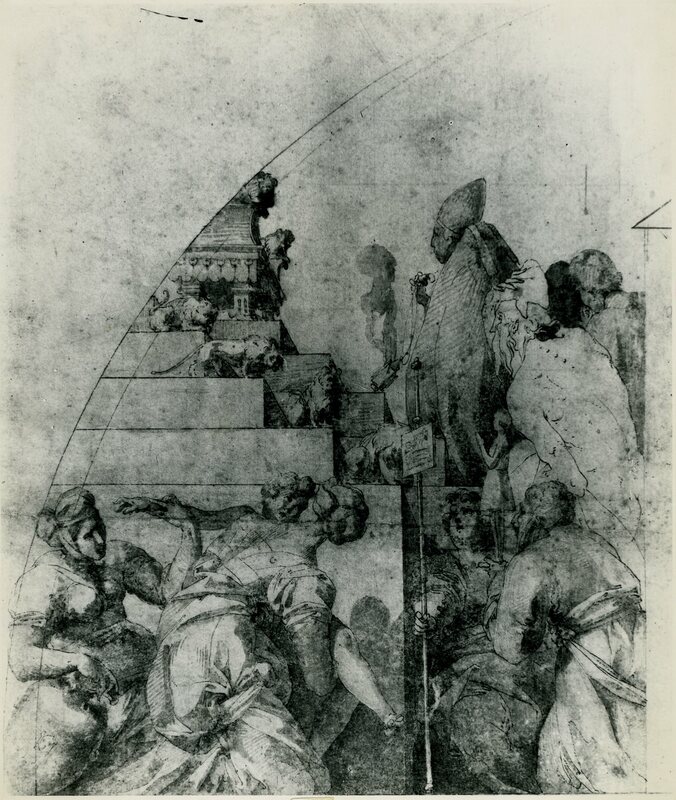 Pen and gray ink and gray wash over traces of black chalk lines and some shading, as in lower left corner (and an added pen line around edge), 14.3 x 9.5, arched at top; laid down; no wm. A brown stain at the upper right on the arm of God, and other brown spots elsewhere. Inscribed on the mount, at the lower left: 3311 above *195, and at the right: B49. Fay, in EdF, 1972, 291, under no. 356, reported my opinion that the drawing is a copy after Rosso. Carroll, 1978, 36, 38, Fig. 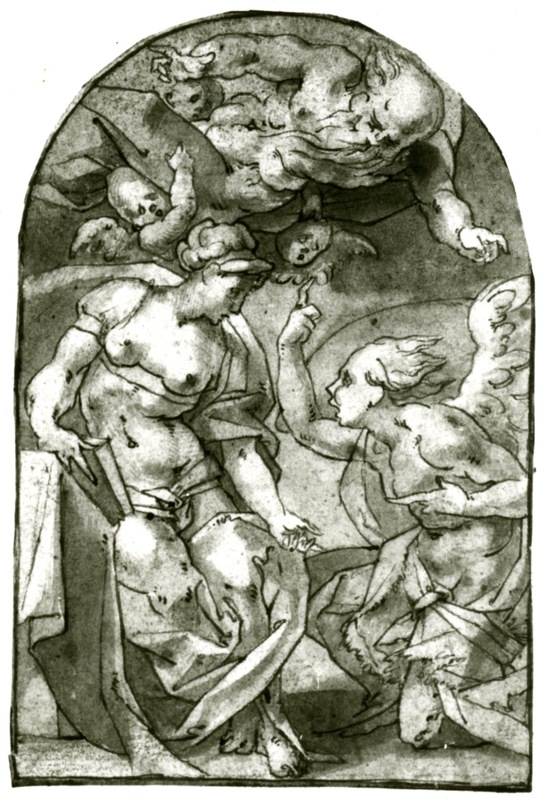 21, 45, 47, n. 24, as by Rosso or a copy of a lost drawing by him, and as done in 1539 or very likely at the end of 1540. Béguin, 1988 (1989), 15, Fig. 14 (wrongly as in Munich), as by Rosso. This extraordinary representation of the Annunciation is in its style remarkably similar to Rosso’s painting in Los Angeles (Fig.P.24a). The figures in both have the same large forms that fill and are spaced within the area of each scene in comparable ways. Furthermore, the drama in both is similarly grand and intense. The Virgin’s head in profile looks like that of the winged figure in the very center of the Death of Adonis in the Gallery of Francis I (Fig.P.22, III S e). 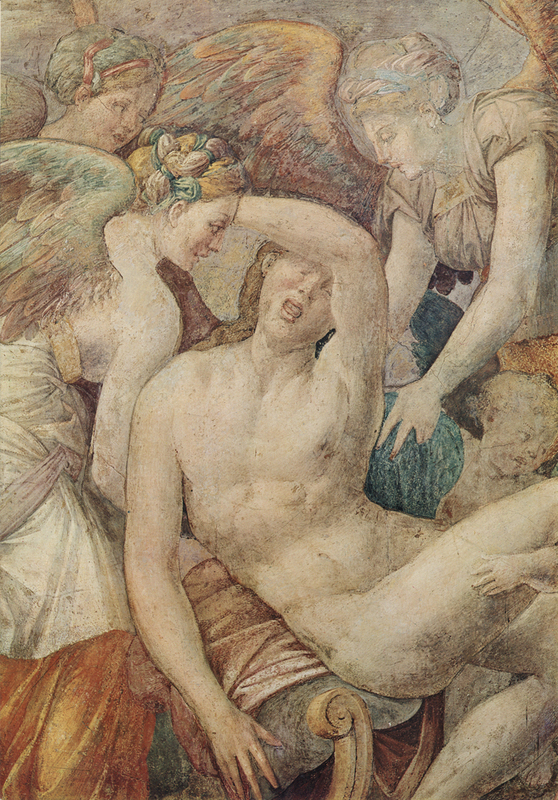 Gabriel’s head resembles that of the man at the lower right of this fresco. As a physical type and in the manner in which his hair blows back, he is similar to the angel behind Gabriel in Rosso’s Annunciation in the Albertina (Fig.D.43a). He is also very much like the figure in the copy in Turin (Fig.D.44) of Rosso’s lost Narcissus. The bald-headed and muscular God-the-Father resembles the figure of Joseph in Rosso’s Holy Family in a Cartouche (Fig.D.75A). Clearly the invention of the Annunciation in Düsseldorf is Rosso’s. 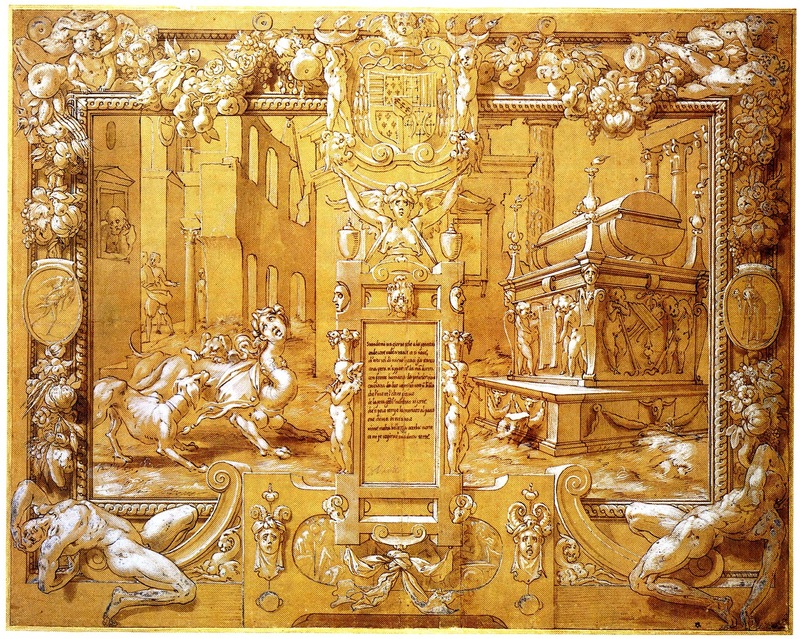 Graphically, the drawing is of the kind represented by Rosso’s Throne of Solomon (Fig.D.34) and the somewhat freer Pandora and Her Box (Fig.D.67a). The outlines of forms and details are described by pen lines of a generally regular breadth. Some interior forms are marked by a series of small parallel pen strokes. Shading is made by several layers of wash and by parallel strokes and cross hatchings applied with the point of a brush. 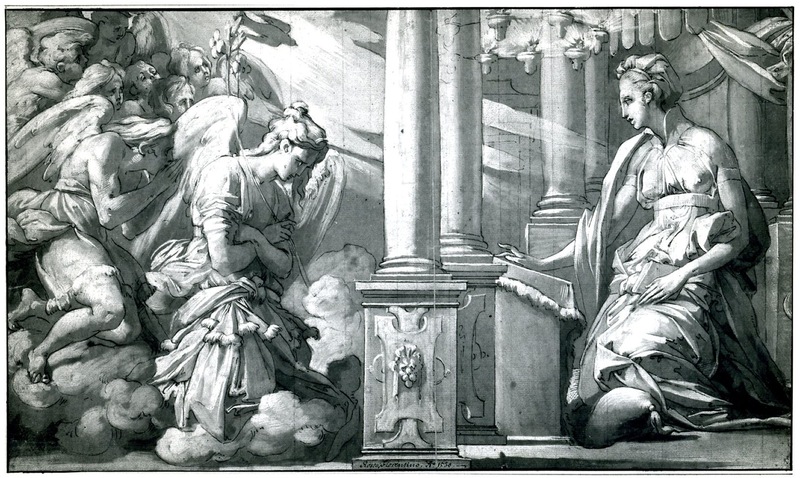 The pen lines and washes can also be compared to those in Rosso’s Annunciation in the Albertina and in his Petrarch drawing at Christ Church (Fig.D.47a), although these drawings are heightened with white while the Düsseldorf drawing is not. 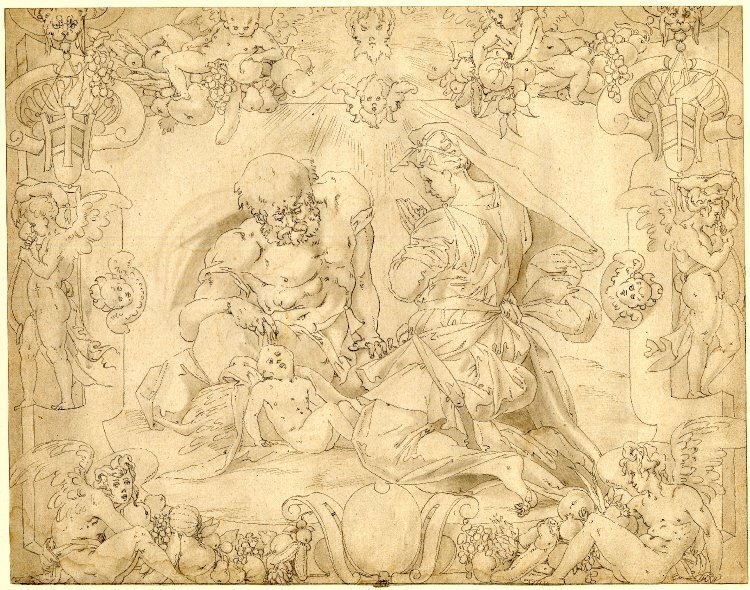 But in spite of the closeness of the handling of the drawing to that of several autograph drawings by Rosso, and even in spite of a certain vigor and deftness of its draughtsmanship, the Annunciation seems rather to be an exceptionally good copy and not a work by Rosso’s own hand. The drawing appears better in a photograph than it actually is. 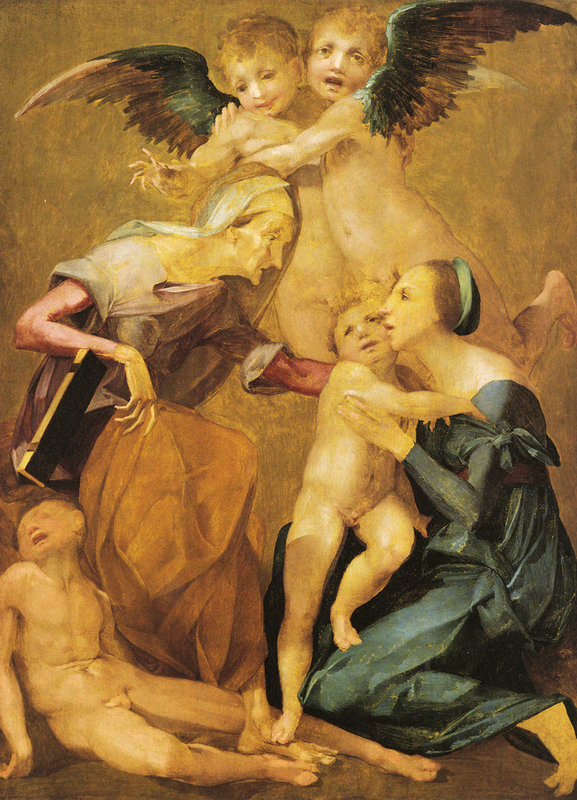 Looking at the drawing itself, the feet of the Virgin appear too awkwardly executed to be autograph, as are her left arm and hand and Gabriel’s left hand. There is also a degree of bluntness and a lack of variety in the pen lines that indicate a copyist. Still, the copy must be very accurate in most details. So closely does the Annunciation resemble in the totality of its style Rosso’s painting in Los Angeles that both would in all likelihood have been done about the same time. 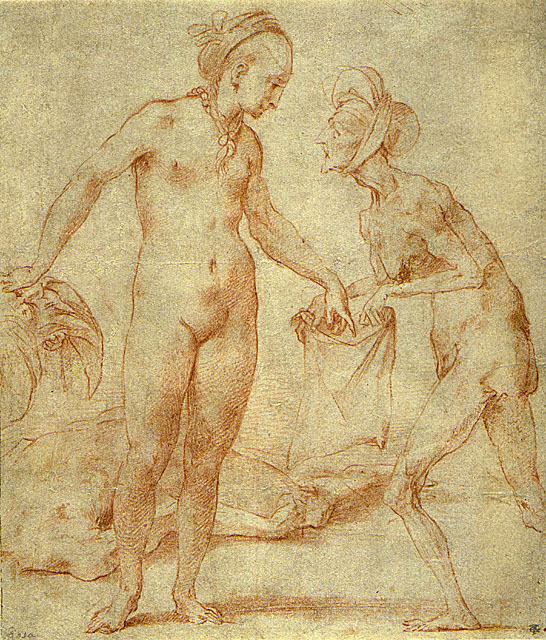 As that unfinished picture would seem to have been done in the last year of Rosso’s life, so, too, the original drawing was probably done in 1540. The strangeness and boldness of the Annunciation are like those of the Los Angeles painting and of Rosso’s Judith and Holofernes in the same city (Fig.D.84a). Even what seems to be the breadth of the original draughtsmanship conveyed in the copy suggests that the Annunciation is a very late invention. PRINT: Limosin, E.90 (Fig.E.90). 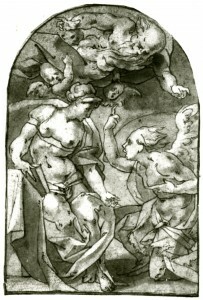 Etching in the same direction as the drawing, but larger. 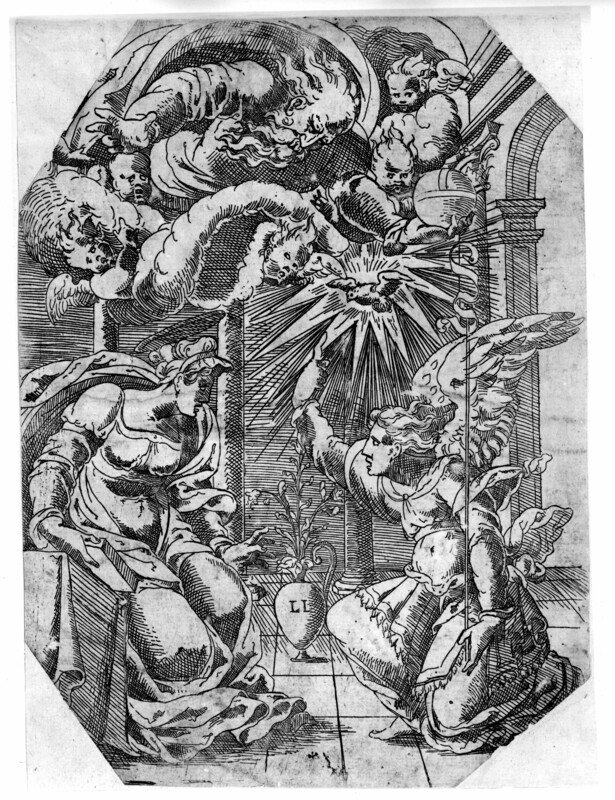 Considerably varied from the drawing with the addition of architecture, an orb held by God-the-Father, a dove, a vase with flowers, drapery over the Virgin’s breasts, a staff in Gabriel’s left hand, and a full garment for him. The poses of all the figures are slightly different. Béguin, 1988 (1989), 15, as not after the Düsseldorf drawing but after another lost drawing by Rosso. I do not think it is necessary to posit a second drawing. 1 The drawing was kindly brought to my attention by Janet Cox-Rearick. 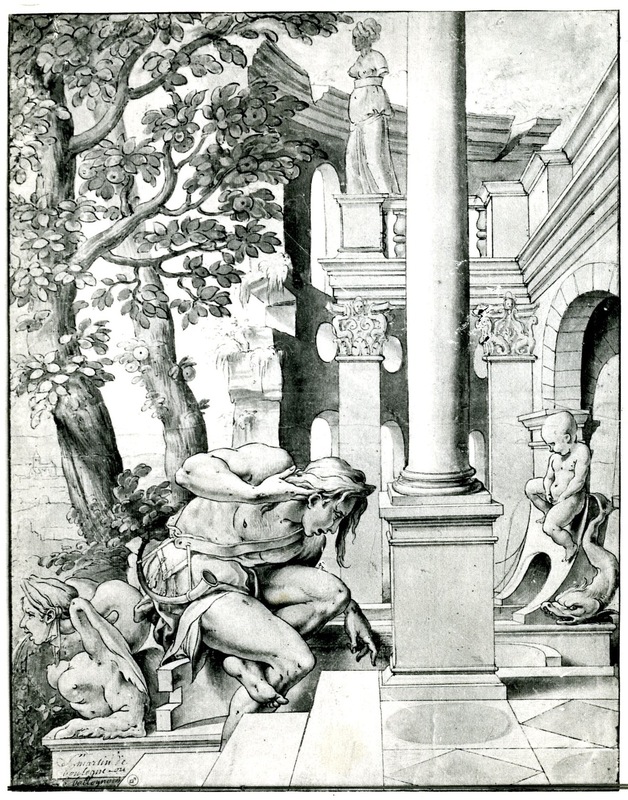 The Krahe Collection was bought by the Kunstakademie in 1778, some time after which the drawing was attributed to Giulio Romano, under whose name it is now catalogued. 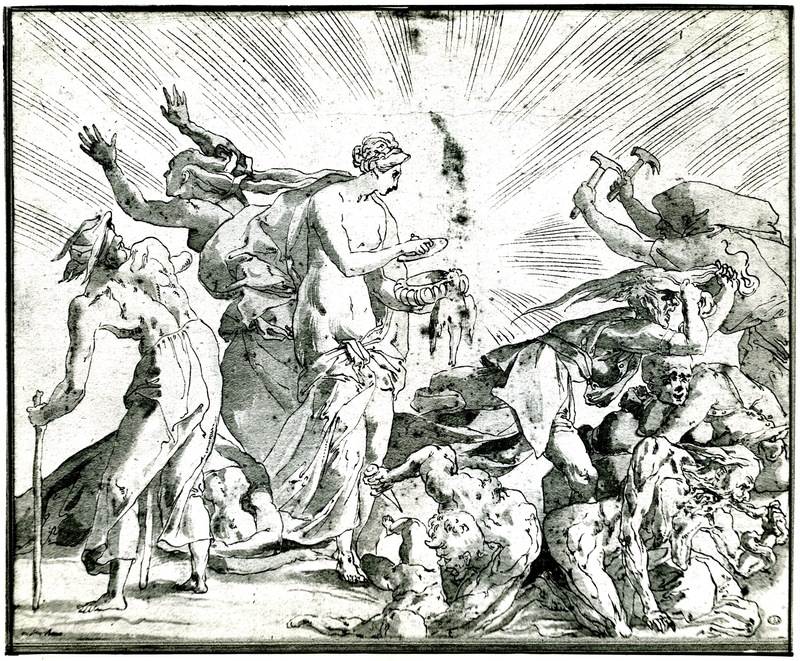 An earlier attribution to Michelangelo appears in Krahe’s inventory of 1779, folio 74, no. 1. I should like to thank Dr. Dieter Graf for this information and for the photograph of the drawing.